Tomorrow, Tuesday, November 7, 2017. It’s election day in the United States. It’s not a federal election day — members of Congress are elected in even numbered years — but many state races will be decided by voters around the country who bother turning up. It’s that “bother to show up” part that would have amazed our ancestors. Because they showed up — and today they continue to show up — in records of voting, voter registration and elections of their day. George said he was born in Kentucky, had been in Texas 34 years and in Parker County 11 years. Charles said he was born in North Carolina, had been in Texas nine years and in Parker County seven years. And Josiah? He said he was born in North Carolina and had been in the state and county 15 years. 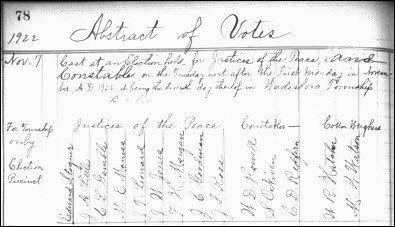 But there are many more records than those of this special 1867 registration — ordinary everyday voter records we should go after as genealogists. And, of course, there’s more. People declaring as candidates for office. Election results. Newspaper articles. All creating records for us to go after. Maybe that’s a plan for tomorrow, huh? After, of course, we cast our own votes… and create our own records… here in 2017.
referring to (now missing) plantation birth registers. GenealogyBank has a good collection. Fascinating reading and great hidden information. And don’t forget that in some states, non-citizens could vote in local and state elections. Correct. Even (gasp) women could vote in some early local elections, particularly for school boards.